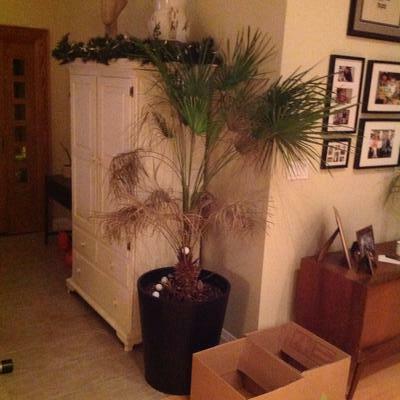 I've had this European fan Palm tree for over four years. Within the last 4-6 months the bottom leaves have been dying off. I still have new growth coming in but the leaves are dying further up as well. The pot is, 24" high and 21" in diameter at the top. Before this started to happen the whole plants was healthy. Also, I have to string the top leaves to keep them from snapping. It's seems as though the stock has not been growing to supports the shoots. I will be moving it soon to a place with more natural light. But it's has been here since I first purchased it.i bought it at around 4 feet ( in the pot ) I repotted it about 2 years ago in the current pot. The Palm sits currently at 7 feet 4 inches from the bottom of the pot. When it comes to palms. They have some particular requirements, one of which is light. Not just brightness, but day length too. This could be the issue, particularly the snapping off part. They do lose their lower leaves, as they grow, especially if light levels are too low to support the growth of both new and old leave. Give the poor thing credit - it's trying! Typically, these plants will lose their leaves in the winter, which consists of them browning and needing pruning in the spring. In warm areas moving it outside for the summer seems to give it the conditions it needs, and the 'spear' in the center will recover and put out new leaves. Apparently, they have to be kept dry in the winter, and this is commonly the cause of death with them. You haven't mentioned your watering regime, but if it's too wet, this could be what's happening. Here is more on Daves Garden Website.